Route 66, one of the most famous and original roads that stretch across the US, has taken the form of a stylish brown wristband! It is marked by a wide brown stripe that stretches around the entire band. 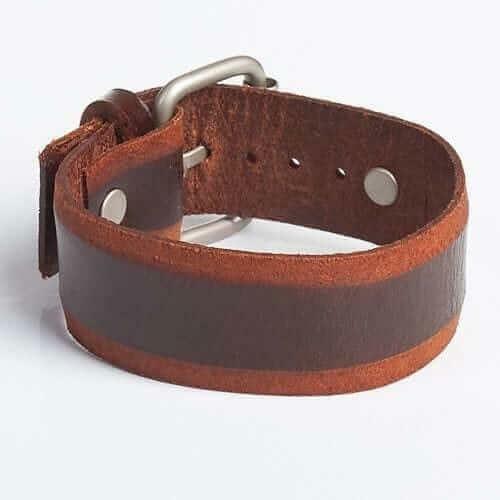 If you’re a traveler, or you just simply like the color brown, this wristband will fit you perfectly! It has multiple sizings available with the full stainless-steel buckle. This is one of our more stylish bands preferred by more modern and chic buyers—but who cares what style you really identify with. If you think this style will make you feel good, what’s the problem? This ban is made of genuine leather. It feels good, smells good, (we won’t say it tastes good), but it sure looks good. Note: We have a full satisfaction guarantee on all our products, meaning that you’ll get a full refund if you are dissatisfied. Check it out for yourself!